Open House May 4th, 2019 Plumeria Festival and Sales event. A plumeria meeting to share ideas. Open discussion on how to care for your plumeria. Learn about plumeria soils, insecticides, fungicides, fertilize, and more. How to session on growing seedlings. Everyone is welcome! The Plumeria event of the year! Please join us for a day of plumeria fun, Door prizes, refreshments and lots of plumeria blooming to enjoy. Free to attend and no purchase necessary to enter the drawings. MARK YOUR CALENDARS - Saturday May 4, 2019, 9:00AM - 6:00PM! Please plan on joining us for a day of plumeria fun! Lots of plumeria blooms to enjoy! Food by John Verville, it doesn't get any better than John's cooking! 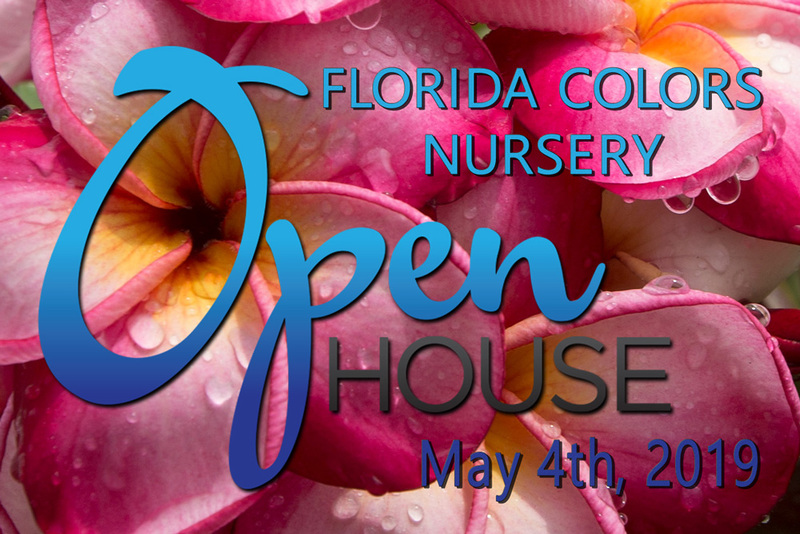 New Florida Colors Cultivars to be announced on May 4th, 2019! Plumeria Classes and Q&A Sessions. The largest selection of Plumeria ever - Too big to ship trees, 1 gal, 3 gal and larger. Grafted plumeria, rooted plumeria and cuttings at bargain prices.